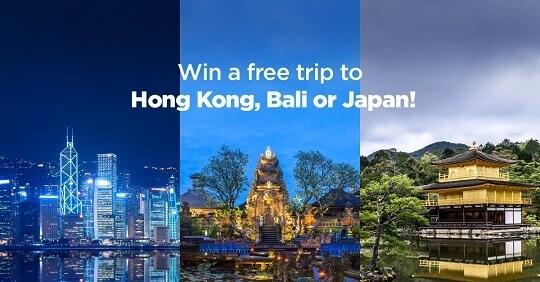 You still have a chance to win a free trip to Bali, Indonesia and Osaka and Kyoto in Japan when you use PayMaya through the company's Travel Blowout promo. PayMaya launched the Travel Blowout promo in February and it will run until April 30, 2017, giving millennials a chance to travel to Hong Kong (February), Indonesia (March), and Japan (April) with family and friends for free. One lucky PayMaya user will win each month and will travel to the specific location that was chosen for that month. It will be an all-expense-paid trip. The winner(s) will get round trip tickets and accommodation for four and Php50,000 pocket money. Each trip is arranged by a travel agency partner so the winner will be able to see the best that each country has to offer. To join, simply download, active, and use your PayMaya app or card. To gain raffle entries, you can download and active the PayMaya app, purchase and activate the physical card, purchase using the app or card with a minimum single receipt of Php1,000, have the account upgraded and approved, and pay bills in-app. You'll get one raffle entry for each activity. The PayMaya app can be downloaded on th Play Store and App Store for free. To load up your account, you can go to any Smart Padala Centers, 7-Eleven Cliqq Kiosks, Ministop Touckpay Kiosks, UnionBank ATMS, BDO online banking, SM Malls Business Centers, and Robinsons Department Stores among others.